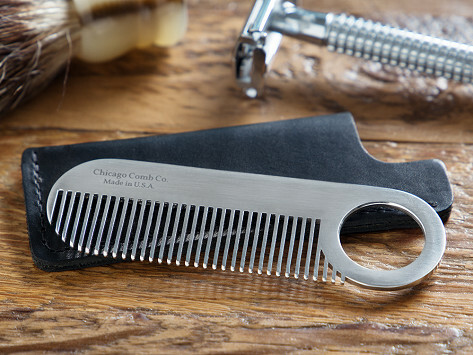 Tidy up your facial hair with this all-American comb. Each is laser-cut and hand-finished from Kentucky steel and Ohio titanium and Made for a Lifetime. Have it engraved with a custom monogram for a personal touch and pass it down for generations. Keep your comb protected in the vegetable-tanned sheath that will age beautifully. It’s crafted in a family-owned Chicago tannery from full-grain leather and hand-oiled for a luxe finish. Dimensions: Comb: 4" x 1.25" x 0.1"; Sheath: 4.1" x 1.3" x 0.2"
Got this for my boyfriend for our anniversary, also had it monogrammed. Fits snugly in the case very well made. 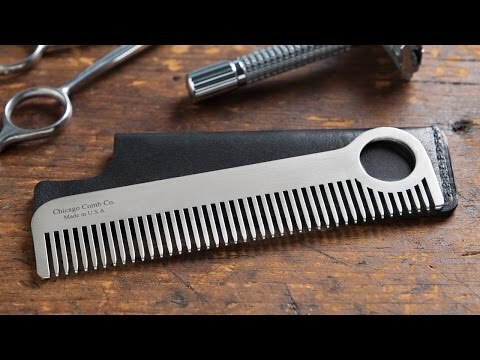 I love that this comb is high quality and made in the US. My husband loved that it's travel sized, durable and personalized. I really like it ,compact and cool style!! !